About a year ago I was creating a personal "home page" on the Internet's "World Wide Web" (http://www.jadebox.com/nilsson/). Home pages are electronic documents that anyone on the Internet can view using a program called a web browser. People have created personal home pages as a way to let the world (or whatever small part of it that cares) know a little about them. Home pages also provide information about a number of subjects. One of the most powerful features of the World Wide Web is that it allows documents to reference other documents anywhere on the Internet. So when I mentioned in my page that I enjoy the music of Harry Nilsson, I searched for a page on the Internet about Harry which I could reference. To my surprise, I didn't find any pages about Harry Nilsson. So I created a simple little page which just mentioned Harry and a few of the songs he recorded. Within a few days I started getting e-mail from other fan's of Nilsson's and even a few messages from some people who knew Harry. So I started devoting more time to adding more information to the pages. The pages have become a community effort now with additions from several other "Harryheads." This newsletter is a spin-off of the Harry Nilsson Web Pages and of the Internet mailing list I started to allow fans to discuss Harry and his music. I hope the newsletter will allow people who are not connected to the Internet to share the experience of meeting other Nilsson fans and to keep up with any late-breaking Nilsson News. The Internet offers a great way for people with common interests to "meet" each other. Fans of Harry's have created several web pages about Nilsson and have joined together through an interactive mailing list. Although I had a problem finding anything about Harry Nilsson on the Internet a year ago, the situation is quite different now. There are several web pages featuring Harry and his works and a mailing list devoted to him. With an extensive discography, biographical information, and links to other pages, the Harry Nilsson Web Pages at http://www.jadebox.com/nilsson/ is currently the definitive Harry Nilsson reference on the World Wide Web. But it is facing some new competition. Bruce Ansley sought and obtained permission from Goldmine Magazine and Dawn Eden to put Ms. Eden's excellent article "One Last Touch of Nilsson" online. Bruce spent some time typing the article and formatting it for display. You can see the results at One Last Touch of Nilsson. This article is perhaps the most in-depth one yet written about Nilsson and his music. Its presence is a welcome addition to the web. Kevin Dooley's Harry Nilsson Home Page features a brief discography and chronology along with some really nice pictures - http://www.me.umn.edu:70/0h/home/kdooley/harry.html. If your browser can display Japanese characters and you can read Japanese, you'll want to check out Kenta Hagiwara's Nilsson pages at http://www.st.rim.or.jp/~kenta/nilsson/nilsson_index.html. Well, even if you can't display or read Japanese, you should visit these well-designed pages. Zak Nilsson, Harry's oldest son, has a set of web pages at http://www.xaqtly.com/. His pages feature his company, Xaqtly Music, as well as some fascinating photos. Some of the photos show Zak with Harry and with Ringo Starr. Especially captivating and touching are a few pictures of Zak's childhood room which Harry painted with scenes from The Point!. At http://info.acm.org/~garland/html/thepoint.html you will find a tribute to Harry's The Point! and you'll find nice discography at http://199.246.24.1/dgrose/nilsson.html. According to a Billboard magazine article published shortly after Harry's death on January 15, 1994, Harry had just finished recording a new album. He completed the album just two days before he died. The album is tentatively titled Lost and Found. The article also reports that Harry was working on an autobiography called "Papa's Got a Brown New Robe" (which has also been considered as the title for the album). The "brown robe" to which the title refers is the one Harry wore on the cover of Nilsson Schmilsson, his most successful album. According to the article the robe itself was donated to the Rock and Roll Hall of Fame Museum. An article in the October, 1990, issue of L.A. Magazine reported that Harry had several plans. These plans included a sequel to The Point!, a children's book called The Boy Who Knew Everything, and the production of several movies from scripts written or co-written by Harry. The future will tell if any of these plans produced anything that we will get to see. The following article originally appeared as a message in the Usenet rec.music.beatles newsgroup. In the article, Colette Moran counters the popular belief that Harry Nilsson never performed live. The message is reprinted with her kind permission. As a staffer at all three Beatlefests each year, I got to meet Harry on a few occasions. I actually was his "personal assistant" one weekend, getting him downtown for a radio interview, helping him during autograph sessions, etc. (during autographing sessions he would sit for hours, which came to be difficult for him, signing for anyone who would make a donation, however small, to the Coalition to Stop Gun Violence--he would collect hundreds of dollars per sitting for this near-and-dear charity). At the fests, Harry would join Liverpool onstage for a few numbers. The first time I saw him sing was before he was sober, and his performance made us all wince. He garbled hoarsely through some old rockers ... no "Without You". We figured he knew it would be pointless to attempt the tough vocals. More than a decade later, at the 1991 Los Angeles, California, Beatlefest. I met him for the second time and he was sober, but in bad shape. He had to have a chair on the stage during his performance with Liverpool. As my friend and I sat shaking our heads, suddenly we heard the unmistakable opening notes of "Without You". We looked at each other and simultaneously mouthed "No way!" We couldn't believe it! The next summer was the Chicago, Illinois, fest where I was his personal assistant and was the last time I saw him. The saddest part of hearing about his death months later was knowing all the projects he was trying to get started... a Return to The Point! among them. Who knows what might have been? ... he and Joe Cocker turned a few heads by jamming at the St. James Club until closing, singing "Shine On, Harvest Moon" over and over with Nilsson's cousin Doug Hoefer at the piano. When George Harrison was in town recently, they spent three days together singing their old tunes. And at Adriano's Restaurant, Terry Gilliam and Nilsson were out singing "Come Fly With Me", "It Had to Be You", and "High Hopes". For The Love of Harry: Everybody Sings Nilsson begins with Harry's friend, Randy Newman, performing "Remember (Christmas)" and ends with another of Harry's friends, Jimmy Webb, singing "Life Line". In between are evocative performances of Harry's music by artists as diverse as Fred Schneider ("Coconut"), Aimee Mann ("One"), and LaVern Baker ("Jump Into the Fire"). The album, produced as a tribute to Harry by Al Kooper and Danny Kapilian, offers evocative interpretations of Harry's songs. Marc Cohn's performance of "Turn On Your Radio" seems to be the favorite of most listeners, while Fred Schneider's frantic version of "Coconut" and LaVern Baker's gospel-like performance of "Jump Into the Fire" rank as the most unique interpretations. The versions of Harry's songs on For The Love of Harry: Everybody Sings Nilsson will never replace Harry's as the definitive performances. But the album is a nice tribute to Harry and a great way to hear Harry's music in a new way. Harry sings the theme for the animated Christmas special Ziggy's Gift. He wrote and sang the theme for Camp Candy, a Saturday Morning cartoon featuring John Candy. Harry appears as "Lassie in a track from Albert Brooks's A Star Is Bought album. Paul Williams recorded a song called Nilsson Sings Newman. Harry once recorded commercial jingles for Ban Deodorant and Red Roof Inns. Harry appeared in an episode of the TV series The Ghost and Mrs. Muir. The Presence of Christmas is "a heartwarming anthology of stories, poems, and songs of the holiday season." It features narration by Bruce Heighley and performances of traditional Christmas songs performed by Harry Nilsson. On the album (produced by Harry's Hawkeye Entertainment), Harry gives emotional performances of "Oh, Come All Ye Faithful", "Silent Night", "Joy To the World", "It Came Upon a Midnight Clear", and "Hark! The Herald Angels Sing". What's a "Harryhead?" Harryhead is the term that the participants in the Harry Nilsson Mailing List have chosen to describe themselves and other devoted Nilsson fans. The more academic-sounding term "Schmilssonians" has also been suggested. 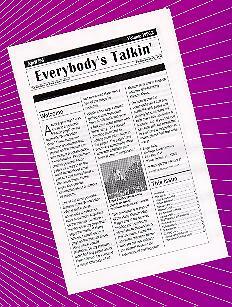 This issue of Everybody's Talkin' is copyright © 1996 by Roger Smith. All rights reserved. No portion of this publication may be reproduced in any manner without the permission of the publisher.